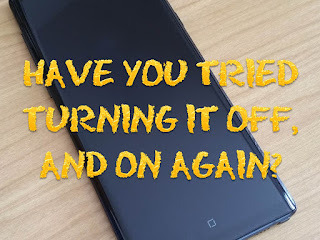 As a happy owner of a Samsung Galaxy Note 9, I have not had too many problems with the phone. It certainly seems a lot less buggy than its predecessor, the Note 4. However, recently I had an interesting bug within my texting service. A friend had sent me a multimedia message - an image, as it turned out - which simply would not download. Each time I hovered over the MMS part of the message, I got an error which read "Failed to download attachment from multimedia message. Try again later". We tried sending the message several times. No luck. I could find no settings which prohibited the reception of MMS. After some minutes of futile poking, I trotted off to Google, and did a search for "mms not coming through samsung Galaxy note 9, "Failed to download attachment from multimedia message. Try again later". Oh, such an easy, easy answer: turn the flaming phone off, then on again. Apparently the text service had - for reasons known only to the ether - got disconnected. A reboot worked its usual magic. Note to self: apply the simplest fix first! !